MANILA—President Rodrigo Duterte on Thursday warned United Nations (UN) Special Rapporteur Agnes Callamard that he will "slap her" if she investigates him for the alleged extrajudicial killings under his administration's war on illegal drugs. "Kaya sabi ko kay Callamard, kung imbestigahin mo ako, sampalin kita. Paano, how can I get a fair hearing if you yourself (do) not even read the publications of your mother organization, United Nations?" 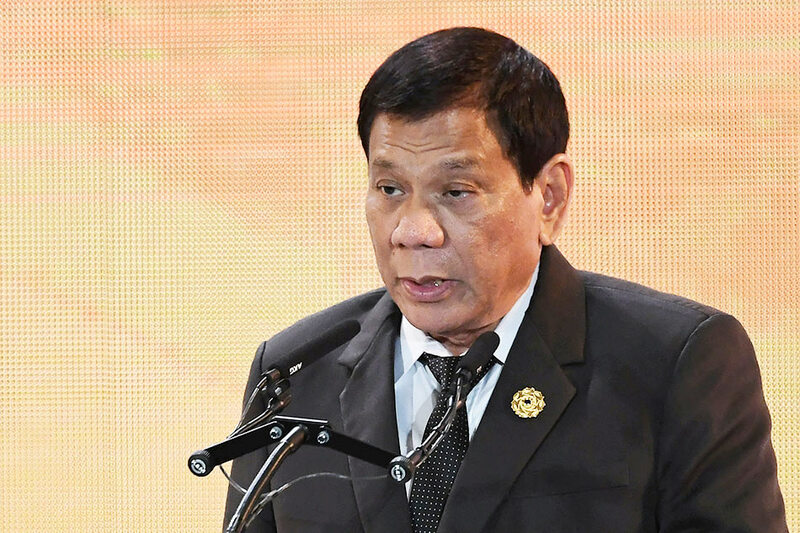 Duterte said in a speech in front of mostly Filipino expatriates in Da Nang, Vietnam. The president's latest tirade against Callamard, special rapporteur on extrajudicial, summary and arbitrary executions, came after she allegedly consulted a doctor who said on television that drugs are harmless. "Di ko naman memorized because I hate her, iyong rapporteur. Ayokong i-pronounce iyong pangalan niya. Nagdala siya ng itim, black doctor daw siya. Nagsabi daw on TV, ‘You know, use of drugs is harmless.’ Sabi ko pu****-***** 'to," Duterte said. Callamard has been critical of the deaths under the Duterte administration and had sought an invitation to visit the country to investigate drug-related killings. The government last year invited Callamard, but she declined due to the conditions set by the government, including a public debate with Duterte, which she said would break UN protocol. She visited Manila in May to attend an academic conference on drug-related issues and grace the Commission on Human Rights' 30th anniversary celebration. The president also challenged the UN to file a case in the International Criminal Court (ICC). "Sabi ko talaga, itong United Nations, sige file the case and let’s have an argument there in the international, whatever, criminal court. Sige, tingnan natin. Isampal ko ito sa kanila. Mismong study ninyo ayaw niyo paniwalaan tapos ako kulungin ninyo because of extrajudicial killing," he said. In April, a complaint was filed against Duterte in the ICC by Jude Sabio, lawyer of self-confessed hitman Edgar Matobato. Sabio said in the 77-page complaint that Duterte "repeatedly, unchangingly and continuously" committed crimes against humanity and that under him killing drug suspects and other criminals has become "best practice."